Many of our favorite childhood foods—macaroni and cheese, hot dogs, Oreos—are now nutritional outcasts. So how do sandwiches, those lunchbox perennials, stack up in this health-conscious age? 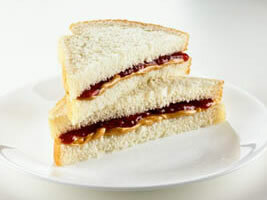 Leslie Bonci, R.D., the director of sports nutrition at the University of Pittsburgh Medical Center, filled us in on the anatomy of five popular sandwiches. Nutritional Pluses: "Tuna is a good protein source and contains some of the (heart-healthy) Omega-3 fatty acids," Bonci says. On The Negative Side: Charlie the Starkist Tuna could swim in the pool of mayonnaise found in the typical restaurant tuna salad. Healthy It Up: Request that the tuna be prepared with less mayonnaise, or ask for less of it on the sandwich, thus cutting your overall fat intake. Leafy green lettuce and tomato count as a serving of veggies. Optimal Time To Indulge: Lunch—the protein in the tuna will help increase mental alertness. Nutritional Pluses: The natural fat in peanut butter is really very protective for heart health, and may also help lower the risk of certain diseases, particularly of cancer. On The Negative Side: "Most peanut butters have hydrogenated oils in them," she points out. And even though peanut butter contains "good" fat, too much will still cause weight gain. Healthy It Up: Spread sparingly, says Bonci, who also recommends whole-grain instead of white bread. Optimal Time To Indulge: Post-workout. The combination of carbohydrates and protein may actually help the body to refuel itself more quickly, says Bonci. Nutritional Pluses: "The garbanzo beans (falafel are fried garbanzo bean balls) are a great source of fiber, the tahini (made from sesame seeds) is a terrific source of Vitamin E and monounsaturated fat. Plus, it's a complete protein." On The Negative Side: A high fat content. Healthy It Up: Request less sauce, a whole-grain pita, and lettuce and tomato, advises Bonci. Optimal Time To Indulge: In the morning, or any time when you won't be working out for a while—falafels tend to rest heavy in the stomach. Nutritional Pluses: Although it has all the hallmarks of a nutritional no-no (red meat and cheese? ), this classic contains protein, calcium, iron, magnesium and iron. And baked ham is very lean, according to Bonci. On The Negative Side: The cheese is high in fat. Healthy It Up: Watch those portions—no piling it on Dagwood Bumstead style—two slices of ham and one of cheese are plenty. Optimal Time To Indulge: Breakfast. It's a good, quick pick for people who don't like cereal. Nutritional Pluses: Turkey is very low in fat, and it's a terrific source of protein. On The Negative Side: Eating turkey frequently can get tedious. Bonci also cautions against supersize sandwich rolls that are more than three inches in diameter. Healthy It Up: You can avoid boredom (and go easier on condiments) by trying new kinds of turkey—honey, black pepper or smoked. Also, up your fiber intake by choosing a pumpernickel or whole-grain roll instead of white. Optimal Time To Indulge: Two hours or so before a workout. And for anyone else reading or wondering, it retained the saved history of my old previous workouts.